Unrelenting, severe headaches are difficult to treat since they usually do not respond to conventional medical management. Among invasive interventions, infusion therapies have emerged as an effective treatment for refractory headaches when other noninvasive treatments have been exhausted. 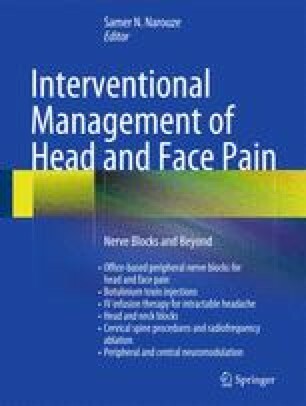 This chapter reviews several pharmacological options of intravenous infusions for intractable headaches. American Headache Society. Refractory headache special section, meeting minutes. 2006. Available from: http://www.americanheadachesociety.org/assets/1/7/Refractory_Headache_Section_Minutes_6-23-06.pdf. 23 June 2006. Fanaee E, Anitescu M, Patil SK. Sustained pain relief after lidocaine infusions for chronic pain syndromes: a retrospective analysis. ASA. 2010;A301. http://education.asahq.org/sites/production.asahq-dev.org/files/a301.pdf.